In the midst of packing for our move to San Francisco early this summer, I found myself seated at my local dinner spot next to a resident of St. Helena, a town in the Napa Valley in California. While I typically value my bar stool at Otto (from which I’ve consumed more Margarita pizzas than glasses of wine) as a special place to enjoy a personal moment amid the bustling city, it would clearly have been a lost opportunity not to at least ask for a few wine country recommendations. When I mentioned my blog, From the Athlete’s Kitchen, my new friend immediately recommended Velo Vino, the tasting room founded and by extension run by the founders of Clif Bar. They also have a farmstand, CSA and a food truck, she told me. It turns out that the Clif Family Farm and Winery were started all the way back in 2004, around the same time I was chomping my way through countless Clif Bars at my desk in New York, insatiably hungry during the months of training for my first marathon. This was also about seven years after Clif bar founder Gary Erickson and Clif co-owner Kit Crawford (who is also Gary’s wife) moved to the Napa Valley. Erickson, having made the brave decision in April, 2000 to turn down an offer to take Clif Bar public and personally receive an eight-figure buyout, left the co-owners in the preferable position to not only develop and implement a core set of company aspirations* for Clif Bar, but also to eventually start a sister brand, Clif Family. 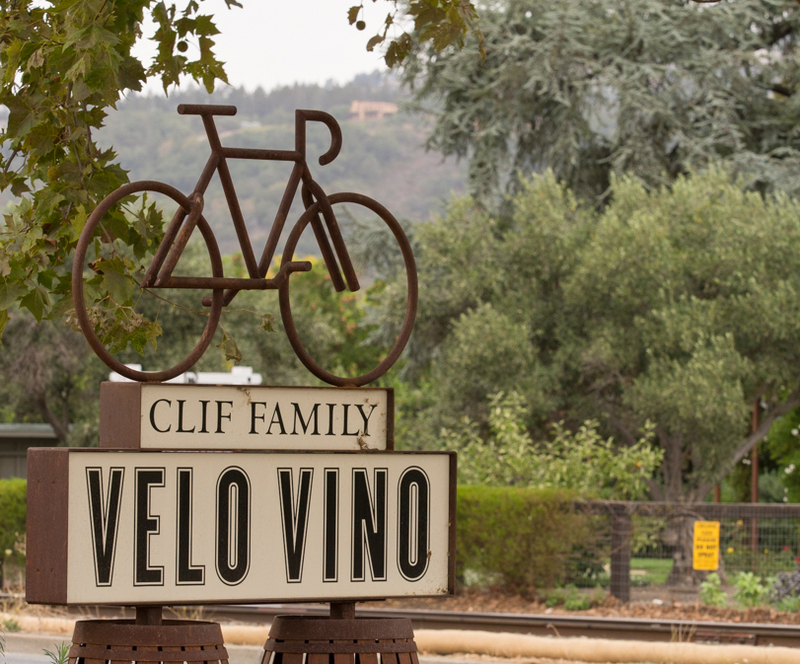 Today, Clif Family encompasses the Clif Family Farm, Velo Vino, the Clif Family Tasting Room, Clif Family Kitchen and the Clif Family Bruschetteria. It was Gary’s early cycling trips through Europe, where the days always ended with local food and wine, plus the sustainable values instilled into Kit by her parents combined with her experience working in a San Francisco specialty food shop that ultimately led the couple to open the Clif Family umbrella. Their shared experiences over several trips to Northern Italy, specifically in and around Bassano del Grappa where their cycling efforts were fueled by the bruschetta from the restaurant Samsara, inspired the Clif Family Bruschetteria. The Bruschetteria is an inviting food truck that on most days sits adjacent to Velo Vino, to augment the tasting room with fresh food from the Farm. It is so much fun to chat with executive chef John McConnell about what’s fresh from the farm and tasting great atop the local bread used for the bruschetta. I got to visit these intrinsically intertwined entities this fall, and in the process learned that my favorite energy bar company delivers far more that I’d ever realized. 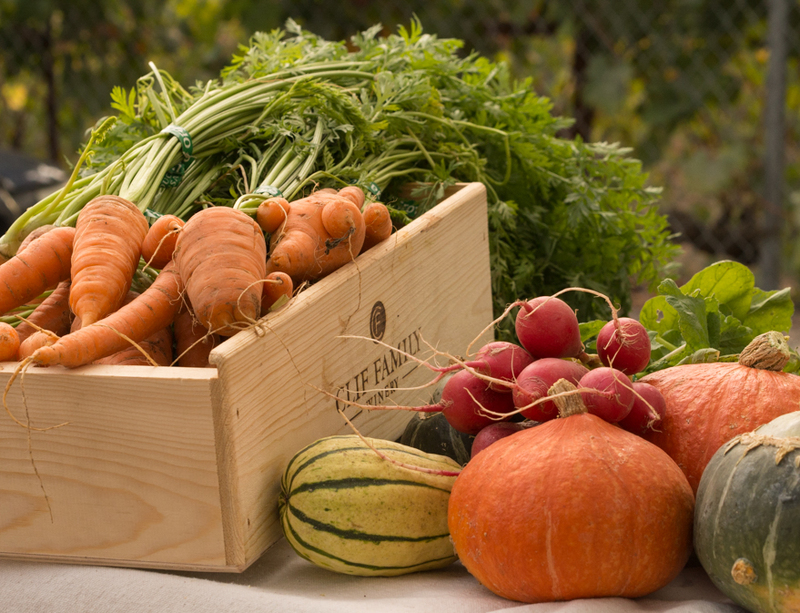 The Clif Family Farm lies at the core of the Clif Family brand, where some of the grapes for the Clif Family Winery are grown**, plus fruits and vegetables for the Clif Family market stand at the St. Helena Farmer’s Market, and many of the ingredients in the products in the Clif Family Kitchen line. Before supplying the Bruschetteria, the food grown on the farm was distributed among members of a CSA, about 40 people at its peak. Occasionally, some of the farm’s bounty even supplies the employee cafe at Clif Bar headquarters in Emeryville, CA. An exciting program in development on the Farm is Clif Family’s Seeds Matter initiative, which encourages the use and trading of organic seeds, taking Clif Bar’s aspiration to care for the planet beyond practices followed only after planting. Click here to read more about Seeds Matter. There is actually a food supply that flows back to the farm, the leftover organic ingredients from the bakeries that produce Clif Bars. In 2015, the Farm began a chicken breeding program with the heritage breed Mottled Javas. The remnant ingredients like organic cherries sent from the Clif Bar bakeries comprise a part of the chicken feed. Drew Erickson, who manages the chickens and breeding program, explained that the breed is the second-oldest in the country, per the Standard of Perfection, the chicken breeder’s bible which dates back to 1847. Mottled Javas are a dual purpose bird, meaning that they are good egg layers and good for meat, while also serving as foragers, eating bugs and weeds while fertilizing the land as they go. In fact the chickens have been moved around the farm in response to invasive weeds. I never knew that a chicken could be considered a working animal, esp one who’s job description includes reducing food waste for a multi-million dollar energy bar brand under the same ownership! Drew gives some of the birds to other farms and schools as a way to help maintain and raise awareness of the heritage breed, while the hens’ eggs supply the Bruschetteria, the market stand in St. Helena and the Clif Bar Employee cafe. As the chicken population grows at the Family Farm, it may be possible to supply the food truck with meat as well. In addition to producing chickens and a variety of fruits and vegetables, the Clif Family Farm also produces olive oil. Wine Club Manager Candice Crawford shared the late- Autumn tradition that started over a decade ago and led to the line of olive oil offered by Clif Family Kitchen. The day after Thanksgiving, thirty family members and friends tried their hand at making oil from the olives harvested from the ten centenarian trees growing on the Farm. As the group tried to rake the olives out of the 100-year-old trees, they found that it’s hard work getting stubborn olives off the branches, going up and down ladders and reaching with rakes! 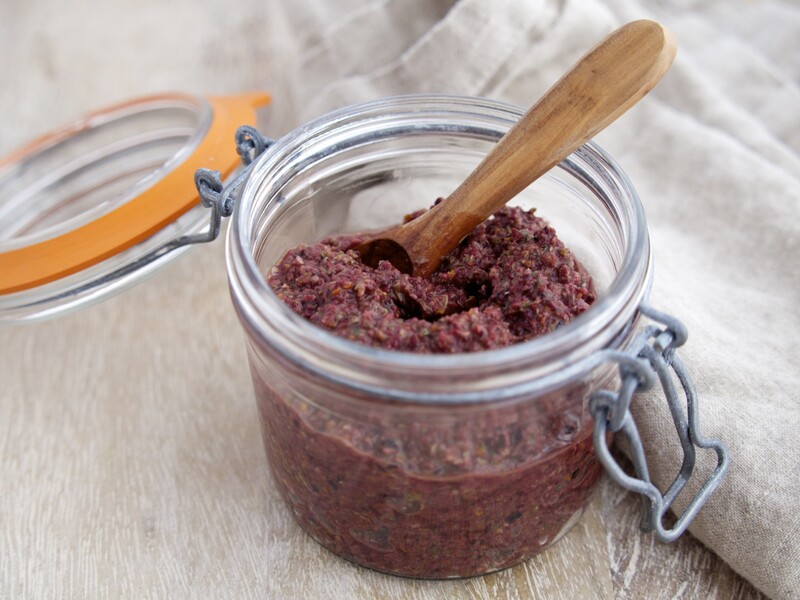 Kit and Gary had bought an olive press and everyone dumped the harvest – twenty buckets worth – into the press right on the spot, for a yield of about ten eight-ounce jars. When the oil was tasted, it was incredibly bitter! (I can attest to the extreme bitterness of an olive picked right off the tree – I spat out the first bite immediately as a small audience watched, waited and laughed…) That first batch was allowed to rest and settle for a few months, after which it was marginally better. A year to the day later, the whole gang tried their hand again, this time with some using electric rakes to help further shake the olive branches (imagine a giant electric toothbrush of sorts) while others held a tarp below to catch the raining olives. There was a better yield that year, about enough for twenty eight-ounce jars. The oil was tasted immediately again, then set to rest. This time the product was a bit better. 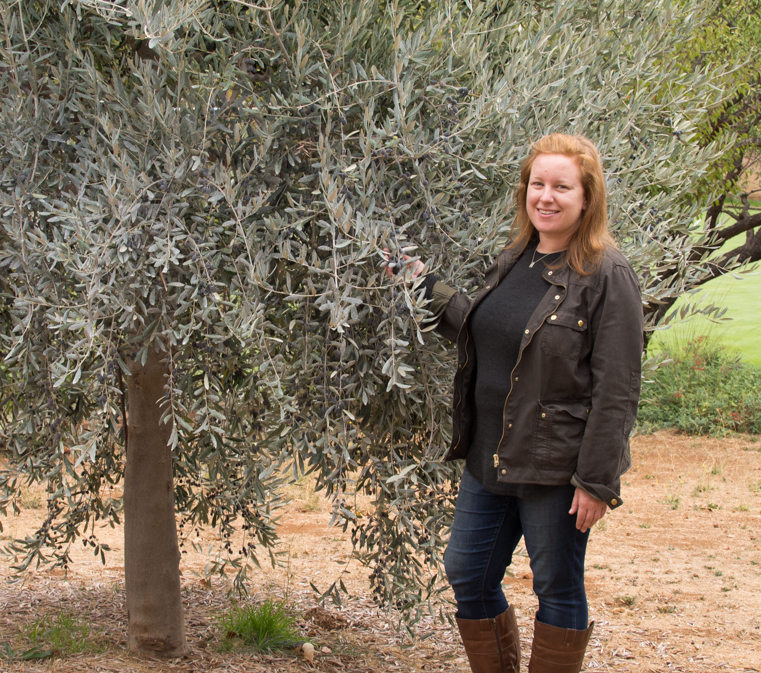 A few years further on, an olive consultant was hired to advise picking and resting time to optimize the harvest (which has continued at around the same time) and a professional picking crew was called. As a result of the overall expertise, the Farm began to see a higher yield, and the oil that had a milder, more subtle flavor. Clif Family Kitchen’s first official batch of olive oil was released in 2008, and in 2010, an additional eighty olive trees were planted. In 2012, an additional piece of nearby land was purchased (nicknamed Croquet because of a court that was on the property), where three hundred established trees grow. Today, all the trees are in use and yield about 100 cases of twelve-ounce bottles per harvest/once a year. Clif Family Kitchen olive oil, preserves from the farm, spice mixes and other foods can be found at the Clif Family tasting room, Velo Vino, and are available to CF Food & Wine Club members (see cliffamilywinery.com). To visit Velo Vino is to enjoy one of the more relaxing yet also inspiring stops on any wine country tour. It’s a fun reminder of the company’s heritage to see a variety of Clif Bar brands available in the tasting room, and several bikes and photos placed throughout the space remind us that the inspiration for Clif Bar came out of the need for a better energy bar during one of Gary’s long rides. The message written on the chalk board in the center of the room harks back to another discovery during one of those early rides, which later played into his decision to keep Clif Bar private, ultimately allowing for the eventual opening of Velo Vino in 2011. That message, “Take the White Road” refers literally to the roads on a Michelin map, on which red roads indicate the most direct, fastest route to a destination, while the white roads indicate a circuitous and challenging yet more delightful option. While Gary and a close friend where on their first cycling trip to Europe and headed for their first alpine pass, the Grosse Scheidegg in Switzerland, they were enlightened by a few locals to the option of taking the White Road. They did, earning unforgettable pedaling and views, and it was the White Road mantra that led Gary to eschew a personal fortune in the buy out offered by Quaker in order to continue Clif Bar’s journey as a company and entity. Velo Vino buzzes with visitors and locals alike, some stopping by for an espresso or simply to stock up on Clif Bars before a ride. Others settle in with lunch from the Bruschetteria and a bottle from the Winery, and leave with goodies from the Clif Family Kitchen. And behind the scenes, the team at Velo Vino works among other things to support the local community, an effort that bridges back to one of Clif Bar’s Five Aspirations, via their Sip & Support program. On one Thursday each month, 20% of the proceeds from the tasting room and Bruschetteria are donated to benefit a local organization, such as the St. Helena Public School, Girls on the Run, the Sunrise Horse Rescue and the Vine Trail, a bike trail that’s being built in the Napa Valley, to name a few. And each December, Clif Family dedicates three Thursdays to Sip & Support. Since my visit, I have reached for my almost daily Clif bar with a new sense of pride. Not only is the company committed to The White Road, its co-owners are personally behind over two decades and counting of interesting, educational and important projects which benefit both the individual and multiple communities. Now, my Clif bars not only lend satiation, but also inspiration. Remove the stems from the mushrooms and brush caps to remove any loose dirt. Slice all the mushroom caps into approx 1/4″ slices. Heat butter over medium heat in the Dutch Oven, then add the chopped rosemary. Add the carrots, celery and onion and cook until tender, 8-10 minutes, stirring regularly. Add the mushrooms and gently fold into the vegetable mixture. Cook until volume is reduced by a little more than half, about another 10 minutes, stirring regularly. Add the tomato paste and stir to throughly incorporate. Add the wine and bring to a boil, again stirring to mix liquid throughout. Add the chicken broth, rosemary sprig and bay leaf and bring to a simmer. Season with salt and pepper, partially cover (leave a small steam vent) and simmer for 45 minutes. Stir once more and add any additional salt and pepper to taste. Kitchen Equipment: For Homemade Chicken Broth: Sharp Knife, cutting board, measuring cups, medium sized bowl, plastic wrap, large stock pot with lid, colander, metal strainer, two medium – large bowls. For Barley Risotto: Medium (about 4-quarts) saucepan, large, deep frying pan, ladle, large stirring spoon, sharp knife and cutting board. Make your homemade broth ‘kit’ as mentioned above as an extension of the dressing for your roasted chicken – place the leeks, lemons & herbs in a bowl and season with salt and pepper. Cover and refrigerate. When ready, remove kit from fridge and unwrap. Place the contents of the kit and the chicken carcass into the stockpot with enough water to float or just cover the chicken, 6-8 cups. Cover, and bring to a boil, then let simmer 1&1/2 – 2 hours. Bring to a boil one last time, then kill the head and remove the cover. Position a large bowl in the sink under a colander. Pour contents of the stock pot into the colander. Then, lift the colander so that the liquid flows freely into the bowl below. Next, set the metal strainer over a second bowl. Pour the liquid caught in the first bowl over the metal strainer to remove bits and bobs – tiny pieces of chicken, pepper, herbs, etc. You will be left with smooth, delicious homemade broth! Store in airtight containers in the freezer for up to three months, or, place broth in a saucepan over low heat on the stove top for immediate use! Place chicken broth in a 4-quart saucepan over low heat. Heat butter in the large frying pan over medium heat until melted. Add the finely chopped yellow onion and saute until turning transparent, about five minutes. Add the barley and stir to coat with the butter/onion mixture. Working one ladle at a time, add warmed broth to the pan. Stir and evaluate to make sure that barley is *just* covered by the broth. Simmer until broth is mostly absorbed. Repeat the broth ladling process until barley is cooked through, about 35 minutes. 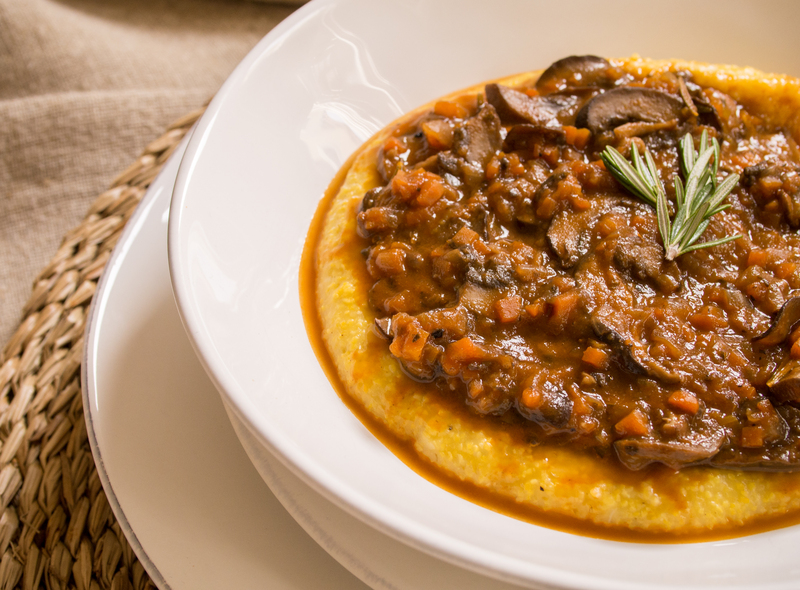 Serve immediately, or store in an airtight container in the fridge for up to one week. Rinse the olives in cold water and add to the food processor. Repeat with the anchovies, if using. Add all other ingredients to the processor and blend until a consistent texture is achieved, one – two minutes. Store in an airtight container in the fridge for up to two weeks. Brush or spray spring-form pan with olive oil and set aside. Whisk flours, baking powder, baking soda, dried thyme and salt together, set aside. Beat 1/4 Cup Sugar and 1/2 Cup Olive Oil in a large bowl. Beat in yolks, then flour mixture, then yogurt, zest and vanilla, set aside. Clean and try the egg beaters, then, beat whites in a separate bowl until soft peaks form (about 3-4 minutes on the highest setting). Add in the remaining 1/4 Cup Sugar and continue beating until stiff peaks form, about another 3-4 minutes. Working in two batches, gently fold egg whites into batter until just incorporated. Pour/scrape batter into the prepared pan and bake for 25 minutes/until a toothpick comes out clean. Poke hot cake with a toothpick all over and slowly pour 1/2 the lemon syrup over. Once absorbed, repeat with the remaining half. Let the cake cool on a wire rack, then, clear the edge of the cake with a knife and remove sides of spring-form pan. Carefully slide a knife or spatula to remove bottom of pan (or simply set bottom of pan on a serving plate). 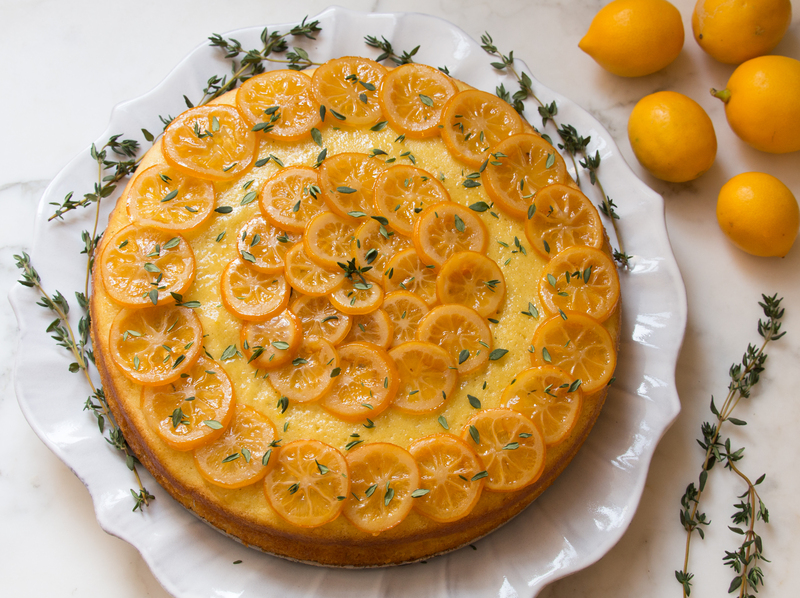 Arrange lemon slices however you like and top with fresh thyme leaves. Kitchen Equipment: Medium saucepan or frying pan, large pot for cooking pasta, colander, large stirring spoon, lemon zester or microplane, sharp knife, cutting board. Assemble all measured and prepared ingredients and tools within arms reach of the stovetop. Set pasta water to boil in large pot. Drain about 1 Tbsp oil from the tuna or sardine can into the frying pan, over medium heat. Add the tomatoes, juice & sauce included, plus the fish, leaving the fish in large chunks. (The chunks will reduce down as you stir normally and generally continue through the steps – breaking them down at this phase will create a mushy sauce.) Cook over medium – low heat, stirring occasionally, until liquid is reduced. Add the wine, again stirring occasionally until liquid is reduced. Add the capers, lemon zest and juice, stir once more to incorporate and cover to keep warm. Drop pasta into boiling water and cook per the package instructions – fine of course to do this simultaneously as you cook the sauce! Add 2/3 of the sauce to the cooked & drained pasta, and toss with almost all the breadcrumbs and fennel fronds. Place the mixed pasta and sauce in a serving bowl, and top with remaining sauce, crumbs and fronds. Garnish individually with a few more fronds and Parmesan. I hope you’ll love this quick weeknight dinner!